A little hope for humanity for your Friday. 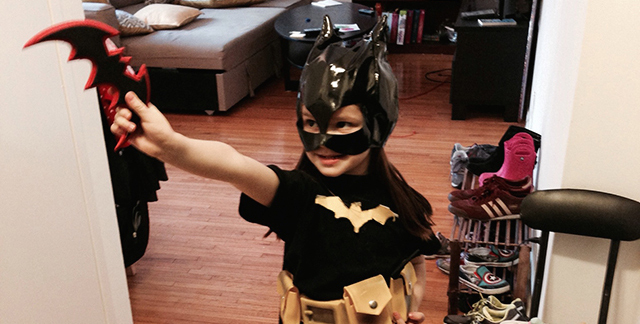 About a week and a half ago we shared fantasy author Peter V. Brett’s story of raising a geeky daughter in a world where girls and women are far too often excluded from superhero merch. Specifically, the subject was DC Comics’ Justice League: Axis of Villains game, which Peter had to do some DIY on so his young daughter Cassie could play as a female character. Here, Peter shares game maker Wonder Forge’s response to his criticism. This piece was originally posted on his blog and has been republished with permission. A couple weeks ago, I posted about the DC Comics-licensed board game Justice League: Axis of Villains by kids game designer Wonder Forge. I was—justifiably—put off by the fact Wonder Forge had decided to excise Wonder Woman and the other women of the League from the game, thereby sending a message to young girls, my 6 year old daughter Cassie included, that they were not welcome to imagine themselves as part of the game. I noted the lengths I needed to go through to “fix” Axis of Villains, creating chits and control pads for female superheroes to add some gender balance to the game, and called on both DC and Wonder Forge to do better. Cassie loves superheroes, and keeping her feeling included in what is often a male-centric comic/merchandise market is an ongoing problem I talk about a lot on social media. The Axis post was just another bit of personal grousing on the topic. Not the first nor the last. But the piece got surprising traction. I expect some of that was due to how adorable Cassie looks in her superhero costumes, but in no small part to a cross-post by The Mary Sue [Editor’s note: Hi there! *waves*], which got the story out to a wider audience than my normal fanbase. In the time since, the story has collected a few hundred comments and seen wide support and signal boost. The issues I have trying to keep my daughter comfortable in the genre community clearly resonated with countless other parents in the geek realms. To the point where the game designer took notice and responded, much to my surprise. We read your post about the Axis of Villains game and wanted to write back. First off, let me just say that we screwed up, and everyone here knows it. It’s an internal regret for our team that we did not include female super heroes in the game. And it’s a personal regret because so many of us are parents of daughters, who understand firsthand the importance of developing playthings that are inclusive and convey to girls a sense that they can do or be anything. I myself am a mom of 3- and 4-year-old girls and I share your views 100%. In any case, I wanted to let you know that as a company we really learned the lesson. For our next game, DC Super Friends Matching, we included 3 female super heroes: Wonder Woman, Batgirl, and Hawkgirl. This game is a better example of our work. (I’d love to send you a copy if you think your daughter might enjoy it.) If we ever do another run of the Axis game, we will revise it to include female characters. I appreciate that you called us on this and held us accountable. I have shared your post with our product development team, as well as our licensing and senior management teams. It has inspired good internal dialogue on the subject and a renewed commitment to featuring female characters in our super hero games. Thanks for keeping us honest, and we hope that our future offerings will be more to your liking. As you can imagine, I was really thrilled to receive this message. It’s so rare to see such a positive and forward-thinking response to a situation like this. It’s one small success in an ongoing struggle, but it really gave me heart. The persistent courage of Anita Sarkeesian, recent steps by the NFL, the president, and countless other brave women and men who are tired of staying quiet on gender issues has me feeling that we’re close to another tipping point in U.S. society, and we should all keep pushing. Peter V. Brett (www.petervbrett.com) is the internationally bestselling author of the Demon Cycle (The Warded Man, The Great Bazaar, The Desert Spear, Brayan’s Gold, The Daylight War, and the upcoming The Skull Throne) and Red Sonja: Blue and Unchained. Raised on a steady diet of fantasy novels, comic books, and Dungeons & Dragons, Brett has been writing fantasy stories for as long as he can remember. He received a bachelor of arts degree in English literature and art history from the University at Buffalo in 1995, then spent more than a decade in pharmaceutical publishing before returning to his bliss. He lives in Manhattan.